As the EPA's strict new regulations for coal-fired plants kick in, natural gas, should regain the upper hand -- even if its price remains elevated. 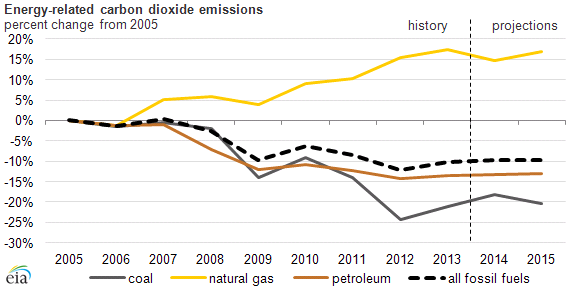 The EIA predicts that coal emissions will decrease 2.5 percent in 2015 to reflect that. Natural gas, of course, comes with environmental baggage of its own; an increase in renewable energy, Climate Progress notes, would help drive down emissions while also lowering electricity costs. The emissions measured here come only from the energy sector, which constitute the majority of CO2 emissions for the U.S. As Climate Central explains, sources include electrical power generation, transportation, manufacturing, home heating, commercial buildings and other industrial sources. The goal, per Obama's climate plan, is a 17 percent decrease below 2005 levels by 2020.